With Loading, the standard PIAS module for intact and damage stability, also the (damage-) stability of hopper dredgers (or, in general, open-top hopper vessels) can be computed, including the effects of spillingover of cargo and pouring in of seawater. On that computation, and the corresponding modus operandi with PIAS, quite some comments can be made, which justifies this separate chapter in the PIAS manual. “Agreement for the construction and operation of dredgers assigned reduced freeboards”, dr-67 & dr-68. Bureau Veritas “Freeboard of dredgers and barges fitted with bottom dump doors”, N.I. 144, 1971. 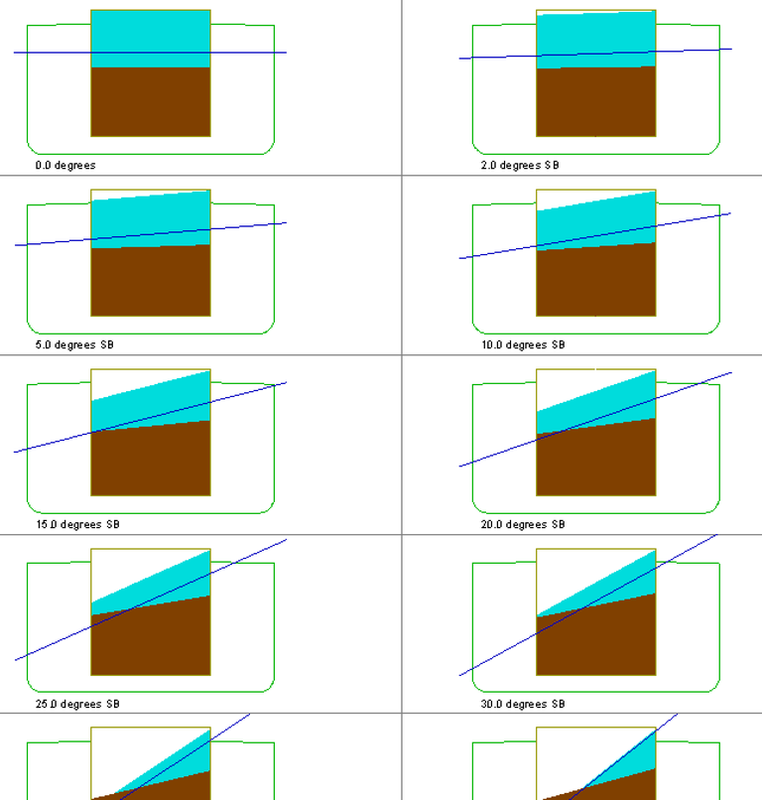 Russian Maritime Register of Shipping (RMRS Rules for the classification and construction of sea-going ships, 2014, Part IV, § 3.8 “Vessels of dredging fleet”). MCA 1999 (Merchant Shipping Regulations 1999, MSIS003/part 8, “dredgers”). Guideline 28, “Bijzondere voorschriften voor baggermaterieel” of the Dutch Shipping Inspectorate. RINA, according to the guideline below. For the intact stability the cargo is assumed to be allging with resspect to the ship angle, according to the equation θR = (3 - γ).θG, for 1 < γ < 3. That is exactly the same formula as applied with Bureau Veritas, so that one can also be used to compute intact stability according to RINA. For damage stability the assumption “In the damage calculations it is to be assumed that all the cargo is lost as a result of the damage and that the bottom doors remain open leaving the spaces in communication with the sea” applies, so this requires no real calculation with pouring in or out over the edge of the hopper. One can simply use a loading condition with empty hopper, and declare the hopper hold to be damaged. The RINA damage stability requirements can be set with the criteria set as available in PIAS, see Stability criteria for intact stability and damage stability. Open hoppers and their contents are treated separately in a pre-programmed way, depending on the settings and the selected computation method. The first issue is to define the shape and location of the hopper(s), which can be done simply by modelling the hopper(s) in the Layout module as an ordinary compartment. Those compartments must be marked as being a hopper type, which can be done with setting as discussed in Compartment is an open hopper. The next question is how such a hopper can be used and filled in Loading. This is also simple, because since the hopper is essentially a tank, in the weight item list it is positioned just between the other tanks and compartments (or can be added there with the [Tank list] option, an operation which is discussed in Read tanks as weight item). A hopper occupies two lines in the weight items list, once with its cargo content and the other with the (not yet poured out) water on top of the cargo. These two lines are irrevocably linked, which implies that if one line is removed, the other will also disappear. The hopper edge, which is the upper rim of the hopper, over which the cargo can spill over or the seawater can pour in freely. These points of the hoper edge must always be explicitly given, it is not the case that the top of the hopper compartment is automatically assumed to be the spill-over edge. If the stability calculation is made including the effects of trim, it is important that the forward and aft hopper edges also include modelled with these points. A closable overflow, through which whether or not cargo and/or seawater can flow, depending on the assumptions of the selected regularions. This opening might be adjustable in height, the range of which can be specified in column ‘range’ in the same menu, just right of the column where the type of overflow is given. The range is in meters, and can be positive (then the overflow can be adjusted upwards from the height specified at this point) or negative (in which case the opening can be adjusted downwards. An overflow may sometimes only be taken into account if its cross-section is sufficiently large, as required by the chosen regulations. Bureau Veritas and RMRS: if the overflow is potentially closable during filling, then the cargo does not flow out through the overflows, and otherwise it does. All other methods: the cargo does not flow out through overflows. The (damage-) stability calculations with open hopper are based on a number of loading parameters that can be specified with the [hoPper] function in the loading conditions overview in Loading, as discussed in Loading conditions. These are discussed below. According to regulations, i.e. that cargo and water ‘trim along’ with the ship, so that the cargo trim angle is dependent on the ship's trim angle as prescribed for heel in the calculation method chosen — e.g. with Bureau Veritas N.I. 144, where the cargo heeling angle depends on the ship's heeling angle and density of the cargo. With this setting, this formula will also be applied to the trim angle. Hopper cargo follows actual trim, which indicates that trim of cargo and water are equal to the ship's trim. In other words, surface levels of cargo and water are parallel to seawater level. Zero trim for hoppercargo, which sets the trim of the hopper content always to be zero, regardsless the trim of the ship. Popup window for setting the computation method. This function opens a popup window in which the densities (=specific weights, in ton/m3) of the cargo for which the stability calculations will be made. A special form of ‘density’ is not a number, but the concept ‘design density’ which originates from the dr-67/dr-68 regulations, and which is that particular density where the ship lies exactly at her dredging draft. Such can be specified in the popup box that appears when you press fopr the density-value a key that cannot represent a number (such as <Space>), see the screendump below. Popup window for setting the design density. The dredging draft is specified at the ship's main dimensions, see Main dimensions and allowance for shell and appendages. The dredging draft may differ from the regular summer draft according to the Load Lines Convention, because the regulations for dredgers may allow a reduced freeboard. 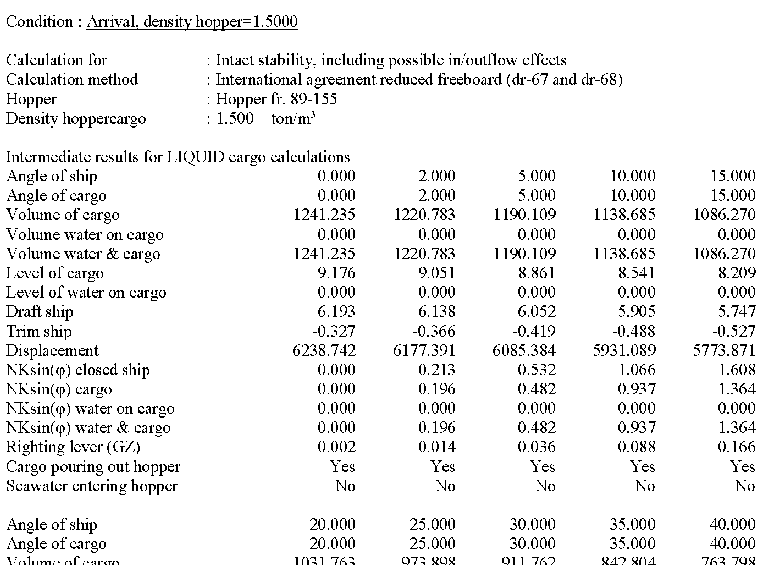 If everything that has been discussed so far has been entered (including the dredging draft, as discussed in the previous section), then the program has sufficient information to generate hopper loading conditions. This means that for each selected densities (as discussed in the previous section) and each (in the overview list of loading conditions) condition which is selected for intact stability, a new condition is generated with the hopper filled. And, if applicable, with the ratio of water/cargo of the hopper determined in such a way that the vessel lies exactly on its dredging draft. This can be used to generate a lot of loading conditions with a single command; if there are e.g. eight selected existing loading conditions and nine densities, then 72 hopper loading conditions will be generated. If a next time hopper conditions are generated again, the question is asked whether the previously generated conditions should be discarded. Whether to do this is up to the user. For enhanced flexibility, in the overview list of loading conditions the column ‘auto-remove’ is included at the right of the loading condition name, which will be filled with ‘yes’ if that particular condition is a generated hopper condition. If you reply yes to the above mentioned question, those will be discarded. If you would still like to keep some conditions, then you can mark those with ‘no’ in that column, so that they will not be automatically removed during regeneration. The loading parameters of each individual loading condition can also be specified, which is done with the function [hoPper] in the menu bar at the top of the list of weight items for that condition. This function can perform the same operation upon a single loading condition, as Generate loading conditions does to a whole series of conditions: filling the cargo and water in the hopper(s) so that the ship lies exactly at its dredging draft. Some ships have height-adjustable overflows, of which the lowest and highest position can be defined, as discussed in Specify additional hopper properties. As a rule, a certain actual position of the overflow will be determined automatically, e.g. with the function from the previous paragraph. However, if you want to manually give the overflow position, you can do so with this function. The manual filling of a hopper is so simple that it does not require a special function. In the list of weight items of a loading condition each hopper has two rows, one for the cargo, and the other for the water op top of the cargo. There you can fill in any desired weight, exactly as is the case for a normal tank. However, it should be borne in mind that in the final calculation this weight could be adjusted, e.g. if water as result of trim flows aout trough an overflow. The so-called floating windows (which are discussed in Define/edit weight items) are also functional for hopper loading. If the chosen computation method requires separate calculations for solid and liquid cargoes, the stability bar graph shows the most critical of the two. If the GUI shows two GZ curves, then one is for solid cargod, and the other for liquid cargo. It depends on the chosen computation method whether this distinction is made. The calculations of longitudinal strength are made on the basis of the longitudinal boundaries and the CoG from each item from the list of weight items. So without any trimming, exactly as it happens with e.g. the shift of liquid method with ordinary tanks. 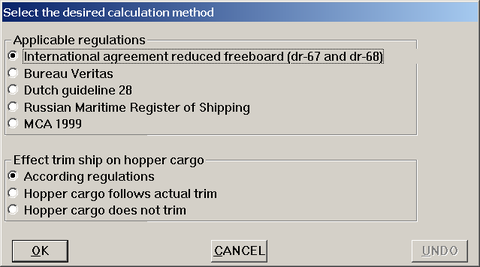 If the chosen computation method includes separate solid and liquid cargo calculations, the question is which trim is to be used for the longitudinal strength calculations. The trim for solid or for liquid cargo? No fundamental answer to this question is possible; in fact, two calculations of longitudinal strength would have to be carried out. However, such a refinement would only be of academic importance, so PIAS simply makes a single calculation, with the trim of that cargo state (solid or liquid) which happened to be calculated first. The output of the stability calculation can be a bit more substantial than a conventional stability calculation. First, because if the calculation method contains separate calculations for solid and liquid cargoes, two full calculations are printed. And secondly, because additional information is printed, such as a page with plots of cargo and water levels for each heeling angle, as well as a page with additional intermediate results, such as levels and moments of cargo and water on cargo. Some examples are given below. Example of stability output, indicating cargo and eater levels. Example of intermediate results in hopper stability calculation. Although none of the supported regulations include deterministic damage stability assessment, this feature is included in PIAS nevertheless, in order to be able to compute (and study into detail) a single damage case out of a set of cases of probabilistic damage stability, which are required for dr-67 & dr-68. Invoking a deterministic damage stability calculation is easy, it is completely the same as for ordinary damage case, as discussed in Deterministic damage stability. The behaviour under heel of the cargo surface is pre-programmed to be according to dr-67 & dr-68, for those are the only regulations where damage stability apply anyhow. So the setting of computation method, as discussed in Calculation method, has no effect here. The probabilistic damage stability will be calculated according to the regulations ‘Agreement for the construction and operation of dredgers assigned reduced freeboards’, a.k.a. dr-68. The calculation is made for loading conditions selected in Loading for damage stability. These loading conditions may only differ in hopper load and height of the overflow(s). This is not necessary for the calculation itself, but dr-68 assumes a loading condition with 50% consumables. A warning will follow if there are differences in the selected loading conditions. Whether the calculation must be done including pouring out of liquid cargo. Whether the light ship condition must be calculated too, and, if so, whether the hopper is assumed to be connected to the sea. Note on the calculation: The cargo in the hopper compartment is assumed not to flow out when the hopper compartment is damaged. Until October 2018 these hopper stability computations were available in a distinct module labelled Hopstab. Data from that module (such as locations of coamings or overflows) cannot be converted to the new program implementation. The amount of data is so limited that the effort of producing a conversion facility would not be worthwhile. However, as an aid in recollecting previously used data, a slimmed-down version of Hopstab will be available for a prolonged period of time. This version has lost all its computation functions, but kept its input menus, where the original input data can still be found. This version might even not be included in the PIAS menu, but can still be found independently, as Hopstab.exe between all other modules in the PIAS program directory.